AOR GABA is a neurotransmitter that inhibits the activity of excitatory neuronal impulses to prevent the overstimulation of the brain. 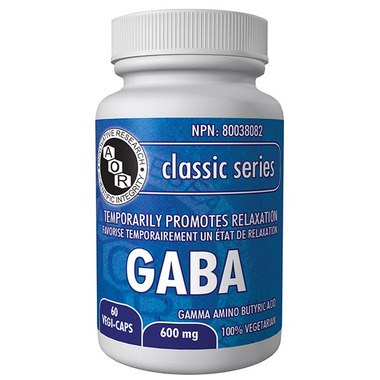 GABA has been referred to as the brain’s natural calming agent and helps to temporarily promote relaxation. I took this for severe anxiety I was having about my deteriorating health. It really helped calm me down. Not gone but much more manageable. I have trouble falling and staying asleep, and this product seems to work for me from time to time ... even though not always. It's hard to say if this product works because it doesn't make you tired. I think it does work, but it's effects are subtle. I take 2 near bedtime. It does not last all night and on it's own it's not a sleep aid in my opinion. It does an ok job of helping quiet a noisy mind, so to speak. I use it with valerian root.